The Oktoberfest tradition that began on October 12, 1810 as a wedding celebration of Bavarian Crown Prince Ludwig to Princess Therese von Sachsen-Hildburghausen, is now celebrated across the world. The modern-day German festival is celebrated internationally with alcohol consumption as an important part of its activities. Now you don't have to go to Germany to participate in the world's largest annual festival to have a taste of Bavarian specialties like sausages that go especially well with the festival beer. 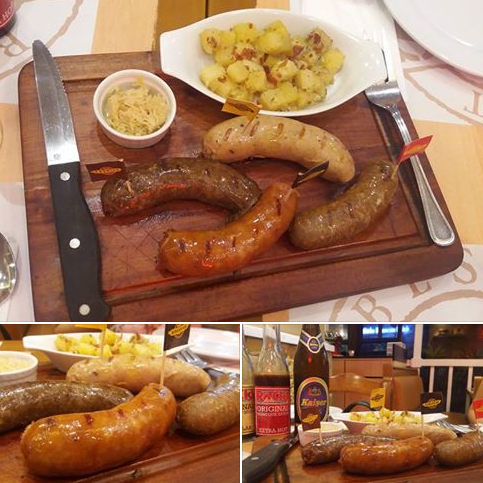 At Racks, you can tantalize you tastebuds with their sausages paired with bottles of Kaiser German beer (P 160). Their house-made sausages come in 4 flavors----Hungarian, Louisiana Hot Links, Garlic and Cheese plus Chorizo. A Sausage Plate (P 345) comes with your choice of 2 sausage variants plus German Potato Salad. 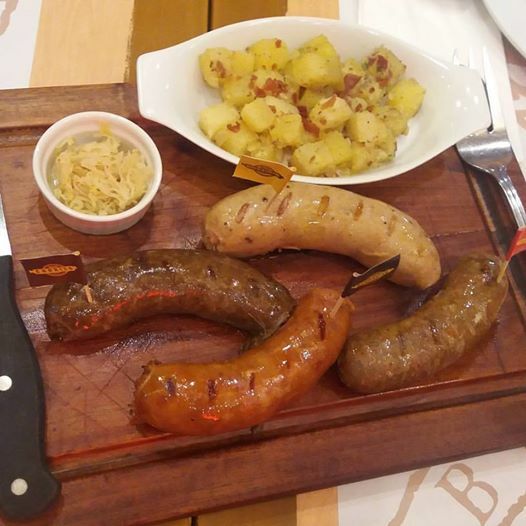 If you come with a party of ravenous foodies, you may opt for a Sausage Platter (P 495) to sample all sausages. It comes with German Potato Salad and sauerkraut (fermented cabbage) on the side. Racks had adjusted their sausages to cater to Filipino taste. Their homemade Hungarian Sausage has a hint of Hungarian paprika to create a subtle spicy, savory sausage for dinner meals. Their Louisiana Hot Links is the more spicy among the variants, great for spicy food lovers. Garlic and Cheese Sausage is a sweet combination anyone will surely fall for. Rack's take on that German Cheese Krainer ( käsekrainer) is really very delicious! I so love its juiciness and specific flavor gained by combining garlic and cheese. I'm a fan of Mexican-style chorizo sausages, and I like the smokiness of Racks’ Chorizo Sausage! The German Potato Salad, sauerkraut and a bottle of German brew, Kaiser Pils promises to complete your Oktoberfest experience at Racks! 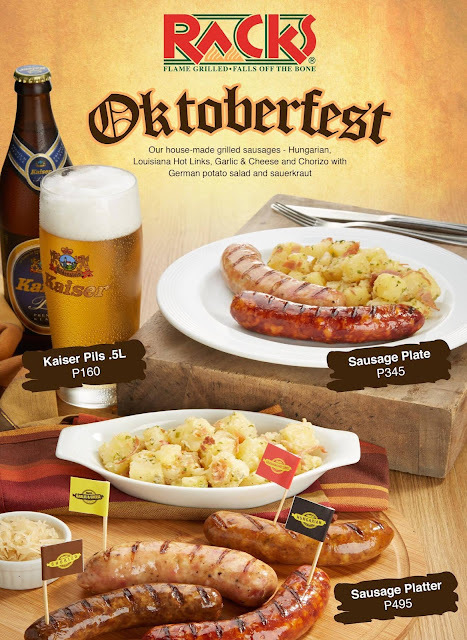 Do visit RACKS for their Oktoberfest offerings!